Flash Alert On Call & Sms will give you flash notification on incoming calls and text messages. The Iphone flash alert feature finaly available for Android phones. + Flash Blinking on Sms Message . + Shake phone to disable Flashlight . + Silent mode to activate Flashing and disable ringing . Best ways to use Flash notifications ? 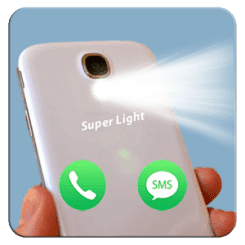 This application use your camera led to make blinking flashs without keeping the app open all the time, so if you decide you no longer want your phone to flash, slide the button to "off". ► If you like Flash Alert On Call & Sms , please rate with 5 stars to support developers .